These one-of-a-kind emerald earrings will make you feel red-carpet ready for any occasion. Containing almost 40 carats of emeralds and more than a carat of black diamonds, these earrings will make your presence felt in any room. 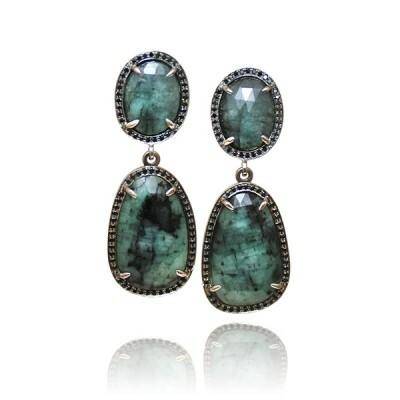 It's not surprising that these earrings are one of our "Studio1098 Staff Picks". These earrings are as elegant as they are dramatic. They are perfect for a formal occasion and will definitely make a statement! But they'd also look fantastic with a white shirt and jeans, which makes them surprisingly wearable and versatile.